Buckingham Yellow Tear Away Saw Lanyard Soft Loop x Bronze Boat Snap. Chainsaw lanyard with built-in bungee is designed for safety and convenience. It is constructed with a tear away safety pack that activates when 200 lbs. of force is applied. This eliminates the possibility of the user being pulled out of a tree if the saw gets hung up on a falling limb. 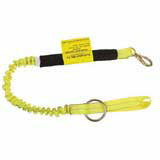 **These straps are for utility use only and should never be used for personal safety of rigging applications.